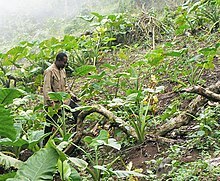 A Bakweri farmer working on his taro field on the slopes of Mount Cameroon. Subsistence agriculture occurs when farmers grow food crops to feed themselves and their families. In subsistence agriculture, farm output is targeted to survival and is mostly for local requirements with little or no surplus trade. The typical subsistence farm has a range of crops and animals needed by the family to feed and clothe themselves during the year. Planting decisions are made principally with an eye toward what the family will need during the coming year, and secondarily toward market prices. Tony Waters writes: "Subsistence peasants are people who grow what they eat, build their own houses, and live without regularly making purchases in the marketplace." Despite the primacy of self-sufficiency in subsistence farming, today most subsistence farmers also participate in trade to some degree, though usually it is for goods that are not necessary for survival, and may include sugar, iron roofing sheets, bicycles, used clothing, and so forth. Most subsistence farmers today reside in developing countries, although their amount of trade as measured in cash is less than that of consumers in countries with modern complex markets, many have important trade contacts and trade items that they can produce because of their special skills or special access to resources valued in the marketplace. Subsistence agriculture emerged in various areas including Mexico where it was based on maize and in the Andes where it was based on the domestication of the potato. Subsistence agriculture was the dominant mode of production in the world until recently, when market-based capitalism became widespread. Subsistence horticulture may have developed independently in South East Asia and Papua New Guinea. Subsistence agriculture had largely disappeared in Europe by the beginning of World War I, and in North America with the movement of sharecroppers and tenant farmers out of the American South and Midwest during the 1930s and 1940s. As recently as the 1950s, it was still common on family farms in North America and Europe to grow much of a family's own food and make much of its own clothing, although sales of some of the farm's production earned enough currency to buy certain staples, typically including sugar; coffee and tea; petroleum distillates (petrol, kerosene, fuel oil); textile products such as bolts of cloth, needles, and thread; medicines; hardware products such as nails, screws, and wire; and a few discretionary items such as candy or books. Many of the preceding items, as well as occasional services from physicians, veterinarians, blacksmiths, and others, were often bought with barter rather than currency. In Central and Eastern Europe subsistence and semi-subsistence agriculture reappeared within the transition economy since about 1990. Subsistence farming continues today in large parts of rural Africa, and parts of Asia and Latin America. In 2015, about 2 billion people (slightly more than 25% of the world's population) in 500 million households living in rural areas of developing nations survive as "smallholder" farmers, working less than 2 hectares (5 acres) of land. In this type of agriculture, a patch of forest land is cleared by a combination of felling and burning, and crops are grown. After 2–3 years the fertility of the soil begins to decline, the land is abandoned and the farmer moves to clear a fresh piece of land elsewhere in the forest as the process continues. While the land is left fallow the forest regrows in the cleared area and soil fertility and biomass is restored. After a decade or more, the farmer may return to the first piece of land. This form of agriculture is sustainable at low population densities, but higher population loads require more frequent clearing which prevents soil fertility from recovering, opens up more of the forest canopy, and encourages scrub at the expense of large trees, eventually resulting in deforestation and land erosion. Shifting cultivation is called Dredd in India, Ladang in Indonesia, Milpa in Central America and Mexico and Jhumming in North East India. While this 'slash-and-burn' technique may describe the method for opening new land, commonly the farmers in question have in existence at the same time smaller fields, sometimes merely gardens, near the homestead there they practice intensive 'non-shifting" techniques until shortage of fields where they can employ "slash and burn" to clear land and (by the burning) provide fertilizer (ash). Such gardens nearer the homestead often regularly receive household refuse, the manure of any household chickens or goats, and compost piles where refuse is thrown initially just to get it out of the way. However, such farmers often recognize the value of such compost and apply it regularly to their smaller fields. They also may irrigate part of such fields if they are near a source of water. In some areas of tropical Africa, at least, such smaller fields may be ones in which crops are grown on raised beds. Thus farmers practicing 'slash and burn' agriculture are often much more sophisticated agriculturalists than the term "slash and burn" subsistence farmers suggests. In this type of farming people migrate along with their animals from one place to another in search of fodder for their animals. Generally they rear cattle, sheep, goats, camels and/or yaks for milk, skin, meat and wool. This way of life is common in parts of central and western Asia, India, east and south-west Africa and northern Eurasia. Examples are the nomadic Bhotiyas and Gujjars of the Himalayas. They carry their belongings, such as tents, etc.., on the backs of donkeys, horses, and camels. In mountainous regions, like Tibet and The Andes, Yak and Llama are reared. Reindeer are the livestock in arctic and sub-arctic areas. Sheep, goats, and camels are common animals, and cattle and horses are also important.. In intensive subsistence agriculture, the farmer cultivates a small plot of land using simple tools and more labor. Climate, with large number of days with sunshine and fertile soils permits growing of more than one crop annually on the same plot. Farmers use their small land holdings to produce enough, for their local consumption, while remaining produce is used for exchange against other goods. It results in much more food being produced per acre compared to other subsistence patterns. In the most intensive situation, farmers may even create terraces along steep hillsides to cultivate rice paddies. Such fields are found in densely populated parts of Asia, such as in The Philippines. They may also intensify by using manure, artificial irrigation and animal waste as fertilizer. Intensive subsistence farming is prevalent in the thickly populated areas of the monsoon regions of south, southwest, and southeast Asia. Subsistence agriculture can be used as a poverty alleviation strategy, specifically as a safety net for food-price shocks and for food security. Poor countries are limited in fiscal and institutional resources that would allow them to contain rises in domestic prices as well as to manage social assistance programs, which is often because they are using policy tools that are intended for middle- and high-income countries. Low-income countries tend to have populations in which 80% of poor are in rural areas and more than 90% of rural households have access to land, yet a majority of these rural poor have insufficient access to food. Subsistence agriculture can be used in low-income countries as a part of policy responses to a food crisis in the short and medium term, and provide a safety net for the poor in these countries. ^ a b Tony Waters. The Persistence of Subsistence Agriculture: life beneath the level of the marketplace. Lanham, MD: Lexington Books. 2007. ^ Marvin P Miracle, "Subsistence Agriculture: Analytical Problems and Alternative Concepts", American Journal of Agricultural Economics, May 1968, pp. 292–310. ^ Goran Hyden. Beyond Ujamaa in Tanzania: Underdevelopment and an Uncaptured Peasantry. Berkeley: University of California Press. 1980. ^ Rapsomanikis, George (2015). "The economic lives of smallholder farmers" (PDF). Food and Agriculture Organization of the United Nations . p. 9. Archived (PDF) from the original on 2016-05-04. Retrieved 2018-01-11. About two-thirds of the developing world’s 3 billion rural people live in about 475 million small farm households, working on land plots smaller than 2 hectares. ^ "Agriculture Ecosystems & Environment (AGR ECOSYST ENVIRON)". Soil erosion from shifting cultivation and other smallholder land use in Sarawak, Malaysia. 4.42. ^ a b c de Janvry, Alain; Sadoulet, Elisabeth (2011-06-01). "Subsistence farming as a safety net for food-price shocks". Development in Practice. 21 (4–5): 472–480. doi:10.1080/09614524.2011.561292. ISSN 0961-4524. Charles Sellers (1991). The Market Revolution: Jacksonian America, 1815–1846. New York: Oxford University Press. Sir Albert Howard (1943). An Agricultural Testament. Oxford University Press. Marvin P Miracle (May 1968). "Subsistence Agriculture: Analytical Problems and Alternative Concepts“, American Journal of Agricultural Economics, pp. 292–310. "Anekdote zur Senkung der Arbeitsmoral"
This page was last edited on 21 April 2019, at 05:23 (UTC).